"Pigeon" and "Dove" redirect here. For other uses, see Pigeon (disambiguation) and Dove (disambiguation). 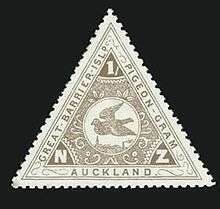 Pigeons and doves are stout-bodied birds with short necks, and short slender bills (and in some species, these bills feature fleshy ceres). They primarily feed on seeds, fruits, and plants. This family occurs worldwide, but the greatest variety is in the Indomalaya and Australasia ecozones. In general, the terms "dove" and "pigeon" are used somewhat interchangeably. Pigeon is a French word that derives from the Latin pipio, for a "peeping" chick, while dove is a Germanic word that refers to the bird's diving flight. In ornithological practice, "dove" tends to be used for smaller species and "pigeon" for larger ones, but this is in no way consistently applied, and historically, the common names for these birds involve a great deal of variation between the terms. The species most commonly referred to as "pigeon" is the rock dove, one subspecies of which, the domestic pigeon, is common in many cities as the feral pigeon. Pigeons and doves are likely the most common birds in the world. Doves and pigeons build relatively flimsy nests – often using sticks and other debris – which may be placed in trees, on ledges, or on the ground, depending on species. They lay one or two eggs at a time, and both parents care for the young, which leave the nest after seven to 28 days. 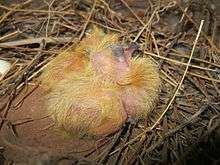 Unlike most birds, both sexes of doves and pigeons produce "crop milk" to feed to their young, secreted by a sloughing of fluid-filled cells from the lining of the crop. Young doves and pigeons are called "squabs". The adjective "columbine" refers to pigeons and doves. The Pteroclididae (sandgrouse) were formerly included in the order Columbiformes largely due to their reported ability to drink by the "sucking" or "pumping" action of peristalsis of the esophagus ("The only other group, however, which shows the same behaviour, the Pteroclididae, is placed near the doves just by this doubtlessly very old characteristic." ); more recently, it had been reported that they cannot drink by "sucking" or "pumping", and were treated separately in the order Pteroclidiformes and were considered to be closer to the shorebirds. Recent phylogenomic studies support the grouping of these pigeons and sandgrouse together, along with mesites, forming the sister taxon to Mirandornithes. The Columbidae are usually divided into five subfamilies, probably inaccurately. For example, the American ground and quail doves, which are usually placed in the Columbinae, seem to be two distinct subfamilies. The order presented here follows Baptista et al. (1997) with some updates. Osteology and DNA sequence analyses indicate the dodo and Rodrigues solitaire are better considered as a subfamily Raphinae in the Columbidae pending availability of further information. The arrangement of genera and naming of subfamilies is in some cases provisional, because analysis of different DNA sequences yield results that differ, often radically, in the placement of certain (mainly Indo-Australian) genera. This ambiguity, probably caused by long branch attraction, seems to confirm the first pigeons evolved in the Australasian region, and that the "Treronidae" and allied forms (crowned and pheasant pigeons, for example) represent the earliest radiation of the group. The dodo and Rodrigues solitaire are in all likelihood part of the Indo-Australian radiation that produced the three small subfamilies mentioned above, with the fruit-doves and pigeons (including the Nicobar pigeon). Therefore, they are here included as a subfamily Raphinae, pending better material evidence of their exact relationships. Exacerbating these issues, columbids are not well represented in the fossil record. No truly primitive forms have been found to date. The genus Gerandia has been described from Early Miocene deposits of France, but while it was long believed to be a pigeon, it is now considered a sandgrouse. Fragmentary remains of a probably "ptilinopine" Early Miocene pigeon were found in the Bannockburn Formation of New Zealand and described as Rupephaps; "Columbina" prattae from roughly contemporary deposits of Florida is nowadays tentatively separated in Arenicolumba, but its distinction from Columbina/Scardafella and related genera needs to be more firmly established (e.g. by cladistic analysis). Apart from that, all other fossils belong to extant genera. For these, and for the considerable number of more recently extinct prehistoric species, see the respective genus accounts. Pigeons and doves exhibit considerable variations in size. The largest species is the crowned pigeon of New Guinea, which is nearly turkey-sized, at a weight of 2–4 kg (4.4–8.8 lb) The smallest is the New World ground-dove of the genus Columbina, which is the same size as a house sparrow and weighs as little as 22 g. With a total length of more than 50 cm (19 in) and weight of almost 1 kg (2 lb), the largest arboreal species is the Marquesan imperial pigeon, while the dwarf fruit dove, which may measure as little as 13 cm (5.1 in), has a marginally smaller total length than any other species from this family. Overall, the Columbidae tend to have short bills and legs, and small heads on large, compact bodies. Their characteristic head bobbing was shown to be due to their natural desire to keep their vision constant in a 1978 experiment by B. J. Frost in which they were placed on treadmills – they did not bob their heads as their surroundings were constant. The wings are large and have low wing loadings; pigeons have strong wing muscles (wing muscles comprise 31–44 % of their body weight) and are among the strongest fliers of all birds. They are also highly manoeuvrable in flight. The common bronzewing is widely distributed across all of Australia and lives in most habitat types except dense rainforest and the driest deserts. The family has adapted to most of the habitats available on the planet. These species may be arboreal, terrestrial, or semiterrestrial. Various species also inhabit savannas, grasslands, deserts, temperate woodlands and forests, mangrove forests, and even the barren sands and gravels of atolls. Some species have large natural ranges. The eared dove ranges across the entirety of South America from Colombia to Tierra del Fuego, the Eurasian collared dove has a massive (if discontinuous) distribution from Britain across Europe, the Middle East, India, Pakistan and China, and the laughing dove across most of sub-Saharan Africa, as well as India, Pakistan, and the Middle East. Other species have tiny, restricted distributions; this is most common in island endemics. 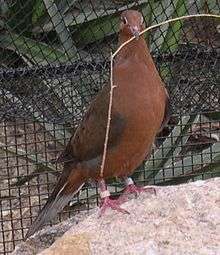 The whistling dove is endemic to the tiny Kadavu Island in Fiji, the Caroline ground-dove is restricted to two islands, Truk and Pohnpei in the Caroline Islands, and the Grenada dove is restricted to Grenada in the Caribbean. Some continental species also have tiny distributions; for example, the black-banded fruit dove is restricted to a small area of the Arnhem Land of Australia, the Somali pigeon is restricted to a tiny area of northern Somalia, and Moreno's ground dove is restricted to the area around Salta and Tucuman in northern Argentina. The largest range of any species is that of the rock dove. This species had a large natural distribution from Britain and Ireland to northern Africa, across Europe, Arabia, Central Asia, India, the Himalayas and up into China and Mongolia. The range of the species increased dramatically upon domestication, as the species went feral in cities around the world. The species is currently resident across most of North America, and has established itself in cities and urban areas in South America, sub-Saharan Africa, Southeast Asia, Japan, Australia and New Zealand. The species is not the only pigeon to have increased its range due to the actions of man; several other species have become established outside of their natural range after escaping captivity, and other species have increased their natural ranges due to habitat changes caused by human activity. Seeds and fruit form the major component of the diets of pigeons and doves. In fact, the family can be divided into the seed-eating or granivorous species (subfamily Columbinae) and the fruit- and mast-eating or frugivorous species (the other four subfamilies). The granivorous species typically feed on seed found on the ground, whereas the frugivorous species tend to feed in trees. There are morphological adaptations that can be used to distinguish between the two groups; granivores tend to have thick walls in their gizzards, whereas the frugivores tend to have thin walls. In addition, fruit-eating species have short intestines, whereas those that eat seeds have longer ones. Frugivores are capable of clinging to branches and even hang upside down to reach fruit. In addition to fruit and seeds, a number of other food items are taken by many species. 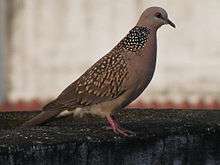 Some, particularly the ground-doves and quail-doves, take a large number of prey items such as insects and worms. 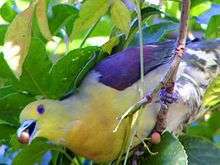 One species, the atoll fruit dove is specialised in taking insect and reptile prey. Snails, moths and other insects are taken by white-crowned pigeons, orange fruit doves and ruddy ground doves. Male pigeons are more opportunistic to male with another female. While many species of pigeons and doves have benefited from human activities and have increased their ranges, many other species have declined in numbers and some have become threatened or even succumbed to extinction. Among the 10 species to have become extinct since 1600 (the conventional date for estimating modern extinctions) are two of the most famous extinct species, the dodo and the passenger pigeon. The passenger pigeon was exceptional for a number of reasons. It is the only pigeon species to have become extinct in modern times that was not an island species. It was once the most numerous species of bird on Earth. Its former numbers are difficult to estimate, but one ornithologist, Alexander Wilson, estimated one flock he observed contained over two billion birds. The decline of the species was abrupt; in 1871, a breeding colony was estimated to contain over a hundred million birds, yet the last individual in the species was dead by 1914. Although habitat loss was a contributing factor, the species is thought to have been massively overhunted, being used as food for slaves and, later, the poor, in the United States throughout the 19th century. The dodo, and its extinction, was more typical of the extinctions of pigeons in the past. Like many species that colonise remote islands with few predators, it lost much of its predator avoidance behaviour, along with its ability to fly. The arrival of people, along with a suite of other introduced species, such as rats, pigs, and cats, quickly spelled the end for this species and all the other island forms that have become extinct. Around 59 species of pigeons and doves are threatened with extinction today, about 19% of all species. Most of these are tropical and live on islands. All of the species are threatened by introduced predators, habitat loss, and hunting, or a combination of these factors. In some cases, they may be extinct in the wild, as is the Socorro dove of Socorro Island, Mexico, which was driven to extinction by habitat loss and introduced feral cats. In some areas, a lack of knowledge means the true status of a species is unknown; the Negros fruit dove has not been seen since 1953, and may or may not be extinct, and the Polynesian ground dove is classified as critically endangered, as whether it survives or not on remote islands in the far west of the Pacific Ocean is unknown. The pigeon has contributed to both World War I and II, notably by the Australian, French, German, American, and UK forces. 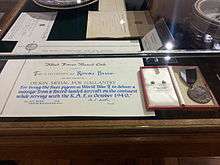 Thirty-two pigeons have been decorated with the Dickin Medal for war contributions, including Commando, G.I. Joe, Paddy, and William of Orange. Cher Ami, a homing pigeon in World War I, was awarded the Croix de Guerre Medal with a palm Oak Leaf Cluster for her service in Verdun and for delivering the message that saved the Lost Battalion of the 77th Infantry Division in the Battle of the Argonne, October 1918. When Cher Ami died, she was mounted and is part of the permanent exhibit at the National Museum of American History of the Smithsonian Institution. The rock pigeon has been domesticated for hundreds of years. It has been bred into several varieties kept by hobbyists, of which the best known is the homing pigeon or racing homer. Other popular breeds are tumbling pigeons such as the Birmingham roller and fancy varieties that are bred for certain physical characteristics, such as large feathers on the feet or fan-shaped tails. Domesticated rock pigeons are also bred as carrier pigeons, used for thousands of years to carry brief written messages, and release doves used in ceremonies. White doves are also commonly used in magic acts. In the Hebrew Bible, doves or young pigeons are acceptable burnt offerings for those who cannot afford a more expensive animal. In the Book of Genesis, Noah sent out a dove after the great flood to determine how far the floodwaters had receded. "Dove" is also a term of endearment in the Song of Songs and elsewhere. In Hebrew, Jonah (יוֹנָה) means dove. The "sign of Jonas" in Mat 16:1–4 is related to the "sign of the dove". Jesus's parents sacrificed doves on his behalf after his circumcision (Luke 2:24). Later, the Holy Spirit descended upon Jesus at his baptism like a dove (Matthew 3:16), and subsequently the "peace dove" became a common Christian symbol of the Holy Spirit. In Islam, doves and the pigeon family in general are respected and favoured because they are believed to have assisted the final prophet of Islam, Muhammad, in distracting his enemies outside the cave of Thaw'r in the great Hijra. In the Ancient Near East and Mediterranean, doves were used as symbols for the Canaanite mother goddess Asherah, the Phoenician goddess Tanit, and the Roman goddesses Venus and Fortuna. Several species of pigeons and doves are used as food, and probably any could be; the powerful breast muscles characteristic of the family make excellent meat. 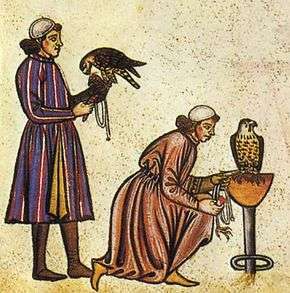 Domesticated or hunted pigeons have been used as the source of food since Ancient Middle East, Ancient Rome and Medieval Europe. It is familiar meat within Jewish, Arab, Assamese cuisine and French cuisines. According to the Tanakh, doves are kosher, and they are the only birds that may be used for a korban. Other kosher birds may be eaten, but not brought as a korban. It is also known in Asian cuisines, such as Chinese and Indonesian. ↑ Harper, Douglas. "pigeon". Online Etymology Dictionary. ↑ Harper, Douglas. "dove". Online Etymology Dictionary. ↑ Crome, Francis H.J. (1991). Forshaw, Joseph, ed. Encyclopaedia of Animals: Birds. London: Merehurst Press. pp. 115–116. ISBN 1-85391-186-0. ↑ Cade, Tom J.; Willoughby, Ernest J.; MacLean, Gordon L. (1966). "Drinking Behavior of Sandgrouse in the Namib and Kalahari Deserts, Africa" (PDF). The Auk. 83 (1): 124–126. doi:10.2307/4082983. JSTOR 4082983. ↑ "Columbiformes (Pigeons, Doves and Dodos)". Francis Hugh John Crome. Grzimek's Animal Life Encyclopedia. Michael Hutchins, Dennis A. Thoney, and Melissa C. McDade (eds.). Vol. 9: Birds II. 2nd ed. Detroit: Gale, 2004. pp. 241–246. ↑ Jarvis, E. D.; Mirarab, S; Aberer, A. J.; Li, B; Houde, P; Li, C; Ho, S. Y.; Faircloth, B. C.; Nabholz, B; Howard, J. T.; Suh, A; Weber, C. C.; Da Fonseca, R. R.; Li, J; Zhang, F; Li, H; Zhou, L; Narula, N; Liu, L; Ganapathy, G; Boussau, B; Bayzid, M. S.; Zavidovych, V; Subramanian, S; Gabaldón, T; Capella-Gutiérrez, S; Huerta-Cepas, J; Rekepalli, B; Munch, K; et al. (2014). "Whole-genome analyses resolve early branches in the tree of life of modern birds". Science. 346 (6215): 1320–31. doi:10.1126/science.1253451. PMC 4405904 . PMID 25504713. ↑ Hackett, Shannon J.; et al. (2008). "A Phylogenomic Study of Birds Reveals Their Evolutionary History". Science. 320 (5884): 1763–1768. doi:10.1126/science.1157704. PMID 18583609. ↑ Yuri, T.; et al. (2013). "Parsimony and Model-Based Analyses of Indels in Avian Nuclear Genes Reveal Congruent and Incongruent Phylogenetic Signals". Biology. 2 (1): 419–444. doi:10.3390/biology2010419. PMC 4009869 . PMID 24832669. ↑ Basically, the conventional treatment had two large subfamilies, one for the fruit doves, imperial pigeons, and fruit-pigeons, and another for nearly all of the remaining species. Additionally, three monotypic subfamilies were noted, one each for the genera Goura, Otidiphaps, and Didunculus. The old subfamily Columbinae consists of five distinct lineages, whereas the other four groups are more or less accurate representations of the evolutionary relationships. ↑ Johnson, Kevin P.; Clayton, Dale H. (2000). "Nuclear and Mitochondrial Genes Contain Similar Phylogenetic. Signal for Pigeons and Doves (Aves: Columbiformes)" (PDF). Molecular Phylogenetics and Evolution. 14 (1): 141–151. doi:10.1006/mpev.1999.0682. PMID 10631048. ↑ Janoo, Anwar (2005). "Discovery of isolated dodo bones Raphus cucullatus (L.), Aves, Columbiformes from Mauritius cave shelters highlights human predation, with a comment on the status of the family Raphidae Wetmore, 1930". Annales de Paléontologie. 91 (2): 167. doi:10.1016/j.annpal.2004.12.002. ↑ Olson, Storrs L. (1985). "The fossil record of birds". In Farmer, Donald S.; King, James R.; Parkes, Kenneth C. Avian Biology, Vol. VIII. Academic Press. pp. 79–238. ISBN 0122494083. Retrieved 28 March 2016. The earliest dove yet known, from the early Miocene (Aquitanian) of France, was a small species named Columba calcaria by Milne-Edwards (1867–1871) from a single humerus, for which Lambrecht (1933) later created the genus Gerandia. ↑ Worthy, Trevor H.; Hand, Suzanne J.; Worthy, Jennifer P.; Tennyson, Alan J. D.; Scofield, R. Paul (2009). "A large fruit pigeon (Columbidae) from the Early Miocene of New Zealand". The Auk. 126 (3): 649–656. doi:10.1525/auk.2009.08244. Because Columba calcaria Milne-Edwards, 1867–1871, from the Lower Miocene at Saint-Gérand-le-Puy in France, is now also considered a sandgrouse, as Gerandia calcaria (Mlíkovský 2002), there is no pre-Pliocene columbid record in Europe. ↑ Necker, R (2007). "Head-bobbing of walking birds" (PDF). Journal of Comparative Physiology A. 193 (12): 1177–83. doi:10.1007/s00359-007-0281-3. PMID 17987297. ↑ Hagey, LR; Schteingart, CD; Ton-Nu, HT; Hofmann, AF (1994). "Biliary bile acids of fruit pigeons and doves (Columbiformes)" (PDF). Journal of Lipid Research. 35 (11): 2041–8. PMID 7868982. ↑ Shehzad Zareen; Hameed Ur Rehman; Raqeebullah; Abid Ur Rehman (2016). "Fidelity Analysis among Mates of Different Breeds of Columba livia, District Kohat, KPK, Pakistan" (PDF). Journal of Entomology and Zoology Studies. 4 (4): 195–197. Retrieved 20 August 2016. ↑ Walker, J. (2007). "Geographical patterns of threat among pigeons and doves (Columbidae)". Oryx. 41 (3). doi:10.1017/S0030605307001016. ↑ BirdLife International (2009). "Socorro Dove Zenaida graysoni". Data Zone. BirdLife International. Retrieved 26 June 2009. ↑ "Cher Ami "Dear Friend" WWI". Flickr. Retrieved 26 April 2008. ↑ Yonah Jonah Blue Letter Bible. Blueletterbible.org. Retrieved on 5 March 2013. ↑ God's Kingdom Ministries serious Bible Study Chapter 12: The Sign of Jonah. Gods-kingdom-ministries.net. Retrieved on 5 March 2013. ↑ The Enduring Symbolism of Doves, From Ancient Icon to Biblical Mainstay by Dorothy D. Resig BAR Magazine Archived 31 January 2013 at the Wayback Machine.. Bib-arch.org (9 February 2013). Retrieved on 5 March 2013. ↑ CHAPTER 40 – DINNERS AND DINING Mrs Beeton's Book of Household Management. Mrsbeeton.com. Retrieved on 5 March 2013. Wikimedia Commons has media related to Columbidae. Look up Columbidae in Wiktionary, the free dictionary. "List of the Breeds of Fancy Pigeons" (PDF). Entente Européenne d’Áviculture et de Cuniculture. 1 October 2009.